-The city has has had lots of improvements so that it looks better, there has also been some new small areas added to the city, there's also 4 new houses added to the city. -Added a new boss inside the Cultist spawn, spawns every hour. -Added a new boss inside the City, spawns once every four hours. 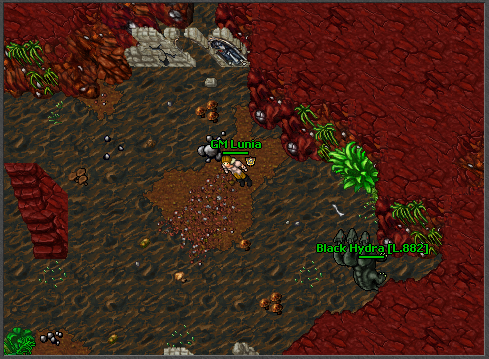 -Added two new quests in the 900+ zone. -The quest monsters inside the 900+ quests are now stronger. -Red, black and green skulled creatures will now do abit less damage. -We don't want people to be botting bosses so we've added an automatic system that should prevent players from botting bosses. The automatic system will prevent afk botters from doing damage to bosses, we also have the option to permanently punish (it will be used for when the automatic system isn't enough) players now with never being able to damage to bosses again. -Fixed a bug that caused the spells exevo mas row, exevo mas flam, exevo mas frigo to deal double damage if you attacked a player inside the same stack as you. -Pushing with weapons is enabled again. -Fixed a bug on the website which caused some players to be unable to add comments/hide their characters. Today I'll make a patch adding some new higher level quests and spawns. We will also be doing some bugfixes and suggestions from our players. -There's now a PvP Arena located inside the city (in there you don't gain skulls, you don't lose anything on death), it can be accessed next to the raid area (west from temple). -Improved some spawns for lower levelled players, it was difficult to complete some of the earlier tasks because some spawns were too small. We have added a couple of new areas to some spawns, like demons, medusas, deepling elites. We have also improved the spawn rate and amount of monsters in some of the early spawns. -The teleport pads inside the corym and rotworms spawns are now located inside protection zones so that pz locked players can no longer make use of them. We also added another floor to the rotworm spawn. -Fixed a bug that made it possible to shoot magic walls and wild growths at the same time. -Fixed a bug that prevented you from pushing creatures while you were attacking something. -Added a new zone in the teleport room, it's for players above level 900, it contains 4 new spawns and 2 new quests. -Monsters inside dungeons now give slightly more experience. Today I'll make a small patch fixing some bugs, adding some requested features and adding some new content. -You can now buy the elven outfit at the dungeon token levers. -When you look at a quest teleport now, it will tell you if you have already completed the quest. You will also get a message if you enter a quest that you have already completed. Example: "13:14 You've been teleported to the boots of haste quest, you've already completed this quest!" -When you look at the magic dungeon elixir now, it will tell you how many of them you have used. -Added a new dungeon, undead, for players above level 750. Contains some new items, has a higher amount of monsters inside it, and the monsters are a bit higher level then the average party members level, so it's abit more rewarding in terms of experience compared to other dungeons. -Added a new spawn inside the 650+ area, Vengeful Grims, made by Henkiie! -Added a spells page on the wiki, it contains GIFs of all our custom spells, made by Nekinoo! -Added a new spawn inside the 750+ area, Fierce Huntresses. -NPC Grizzly now has a tasks for Demonic Knights and Fierce Huntresses. -Enabled the system that prevents you from attacking your guildmates again, if you want to attack them then you can use the command !atkguild. -Added a command that only makes you able to attack players that are over half your level. So if you're level 800, you can only attack players above level 400 if you have used this command. The command is !atkhighlvl. -Various mapbugs were fixed, also adjusted a housing area in the city to be less narrow and now it contains another ladder. -Added a new 650+ spawn, made by Henkiie. -Fixed a lot of issues on the website, you can now properly restore lost passwords, you can now change your email, website is now SSL certified. -A lot of map bugs were fixed. -Exiva has been changed, a lot of players players have sent feedback about exiva ever since the server started about how good exiva was, we want it to be easy for players to locate other players but we will make it require a bit more thought and effort. Now exiva works like regular old exiva, and there has been a new exiva (super exiva) added for players above level 500+. Super exiva costs 25 soul points to cast, so now you can only use it a couple of times every hour, instead of being able to spam it on everyone online. -Added a new system, Dungeons, inspired by server Ascalon. Dungeons are meant to be a daily small teambased (requires minimum a party of 2, maximum a party of 4) activity for players to do. Everyday you can do 3 dungeons, inside the dungeons you will face monsters which are scaled to your party's strength. Currently there are 2 dungeons (1 for level 350+, 1 for level 650+). They are quite simple to make sure everything works correctly but in the future we will try to make them more interesting, and in the future there will be much more different dungeons. What rewards do I get from dungeons? The monsters in dungeons are supposed to give great experience, there's also a random chance to meet a boss in every dungeon. The bosses grants attribute points when slayed, and also got some rare equipment/outfits/mounts. You also gain dungeon tokens when you have completed a dungeon, which can be used to buy some new items. There's also some random items that you can gain when completing a dungeon. How do I start dungeons? You can start dungeons by entering a new teleport, which is located at the 350+ area (so only players of 350+ can complete them), there's also a teleport located at the 500+ area which brings you to the dungeon area. When you're inside the dungeon area, there's an NPC which you use to pick which dungeon that you want to do, then you use an item next to the NPC and you will be teleported to inside the dungeon. Some fixes, requested changes, new quest and a spawn! Making a small patch with some requested changes, bugfixes & new quest and spawn. Changes will be ingame in around 10 minutes. -Added more missions to NPC Madcap. As a result of this, there's some new areas to explore. -You no longer deal damage to players inside the same guild as you, even when you have the PvP "hand" enabled. If you want to be able to attack your guildmates, then you can type !atkguild (the player that typed it can then attack people in his guild). -You can now see a players speed & atk speed when you look at them. -If someone has casted a magic wall or a magic field, you can now see who casted it. -Videos of all 1-350 quests has been added to the wiki (by nefinoo). -Added a new 750+ quest. -Added a new 750+ spawn. -Lowered difficulty of some 500+ quests. -You can now equip items with hotkeys. -Some map bugs were fixed. -Vice leaders of guilds can now broadcast to the entire guild with the !bg command. -Houses with inactive owners should now properly get cleaned everyday again. -You can now buy a new outfit on the website store. Remember that supporting the server is a great way for you to help us out, with the money we earn from the shop we can advertise the server better, we can get more people to help develop the server and it allows us to put more time into the server.